Stepping up his attack against the BJP government, Congress President Rahul Gandhi on Tuesday said that his party “will not let Prime Minister Narendra Modi sleep till he waives loans of farmers”. 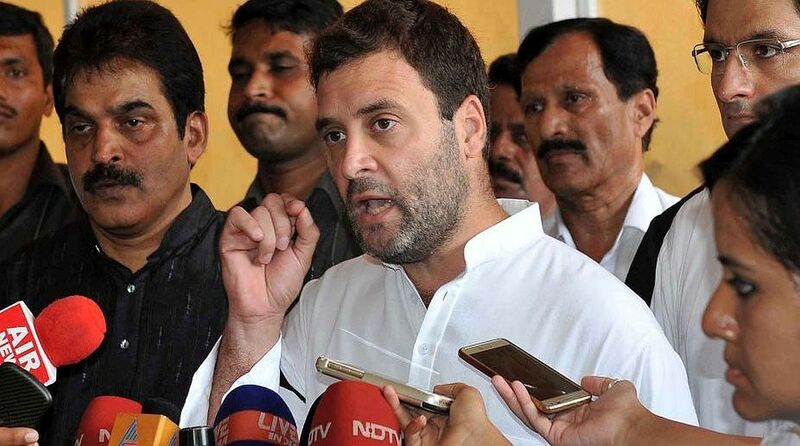 Rahul Gandhi further said that all the opposition parties will unitedly demand sorting of farmers’ issue. “Till now PM has not waived off a single rupee of farmers,” he said. Immediately after taking over as the new Chief Minister of Madhya Pradesh, Kamal Nath on Monday waived loans of farmers to the tune of Rs 2 lakh each, as on March 31, 2018, taken from nationalised and the cooperative banks and thereby, delivering on the Congress pre-poll promise of cancelling farm loans within 10 days of coming to power. Chhattisgarh Chief Minister Bhupesh Bhagel, who too took charge on Monday, followed suit and announced his government will waive farm loans worth Rs 6,100 crore of around 1.66 million farmers. The Congress chief said that Rajasthan will too follow suit in coming days. In the run-up to the state assembly elections, Congress president Rahul Gandhi had promised farm loan waivers in Madhya Pradesh, Chhattisgarh and Rajasthan within 10 days of the Congress coming to power. Speaking to media, Rahul Gandhi also accused PM Modi of “creating two Indias” and charged that the prime minister was not concerned about the farmers of the country and only cares about his entrepreneur friends. “On one side you have farmers, poor, youth, small traders and on the other you have the country’s top 15 industrialists. He put Rs. 3.5 lakh crore into their pockets,” the Congress chief alleged. Attacking the ruling government, Gandhi said the people were told lies and the farmers and small traders were being looted, adding that demonetisation was the “biggest scam” in the world. “Demonetisation was also aimed at stealing money from the poor and giving it to the rich,” he told reporters. On the Rafale deal, Congress President Rahul Gandhi said he was ready to talk but the ruling BJP did not want to. He also called for a parliamentary panel probe into the controversial deal. The Supreme Court had on December 14 given a clean chit to the Centre on the procurement of 36 Rafale fighter jets from France. A three-Judge bench headed by Chief Justice Ranjan Gogoi dismissed all the petitions, and said no Rafale probe was required.